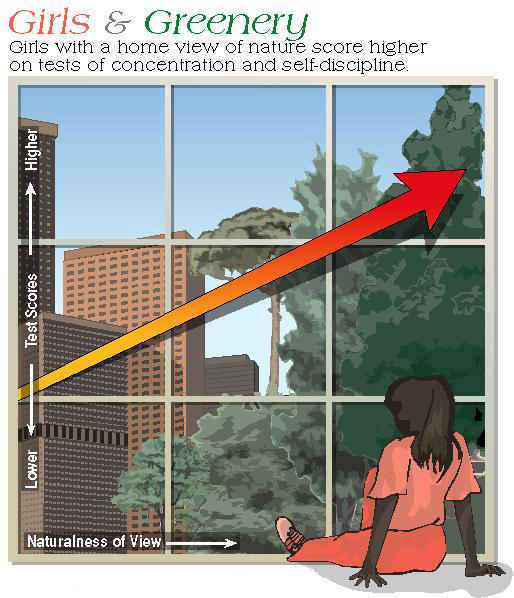 In a study conducted in a Chicago public housing development, girls who lived in apartments with greener, more natural views scored better on tests of self-discipline than those living in more barren but otherwise identical housing. The study tested children on three component abilities of self-discipline: concentration, inhibition of impulsive behavior, and delay of gratification. Girls with green views scored higher on average than girls with less green views on all three tests. Boys showed no link between test scores and the amount of nature near home, most likely because they spend less time playing near home and are then less affected by the environment around it. Self-discipline is an important personal characteristic. The greater a girl’s self-discipline, the more likely she is to do well in school, to avoid unhealthy or risky behaviors, and to behave in ways that make life success more likely. Maintaining trees and greenery at home may foster in girls the self-discipline they need to succeed. Faber Taylor, A., Kuo, F.E., & Sullivan, W.C. (2002). “Views of Nature and Self-Discipline: Evidence from Inner City Children.” Journal of Environmental Psychology, 22, 49-63. Download Original Scientific Article "Views of Nature"
Download Color Flier "Girls & Greenery"
Download PowerPoint Presentation "Girls & Greenery"
More questions? Contact Frances E. Kuo (fekuo@illinois.edu) at the University of Illinois at Urbana-Champaign, Landscape and Human Health Laboratory, 1101 W. Peabody Drive, Urbana, Illinois 61801. This research was supported by the University of Illinois and by the USDA Forest Service Urban and Community Forestry Program on the recommendation of the National Urban and Community Forestry Advisory Council.